Philippines - The island of Palawan was honoured as the no.1 in Top 30 Islands in the World, according to international travel magazine Condé Nast. In fact! 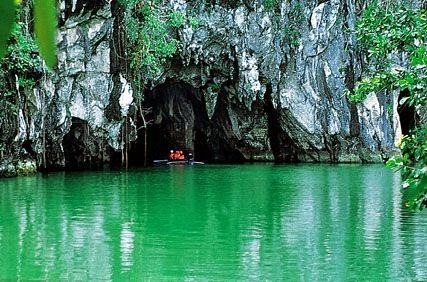 Puerto Princesa Subterranean River is one of the new seven natural wonders of the world in 2012. Palawan was popularly known on its "Underground River", the Puerto Princesa Subterranean River is a UNESCO World Heritage Site with 8.2-kilometer river, said to be the longest navigable underground river in the world, according to local site. Aside from Palawan, the Boracay island was also included to the list of Top 30 islands in the World. Palawan obtained 88.750 points while Boracay garnered 82.683 points. Condé Nast described Boracay as the itty-bitty island (10 square miles) in the Western Philippines and one of the top tourist spots in the region. International travel magazine sees the Philippines as a world's top tourist destinations because of its wonderful natural wonder within the country’s 7,000 islands that you shouldn’t miss. Meanwhile, Lonely Planet ranked the Philippines on the 8th spot of the best destination in the world to visit in 2015. The Singapore is the number one of the top 10 list. Comments or suggestions about "Palawan no.1 in Top 30 Islands in the World" is important to us, you may share it by using the comment box below.